You’ll find Watercolours between The Reef and Mamas, where the sprawling resort does budgetish rooms (by Perhentian Besar standards) spread across a large lawn property. Rooms are a bit rundown and some could certainly do with a coat of paint (in some cases, perhaps a complete rebuilding), but the price is reasonable -- we paid 90 ringgit for am air-con room with private bathroom a short walk from the beach. We found the staff to be especially friendly. Many of the rooms have a bit of an unusual triplex configuration (three rooms to one bungalow) but the rooms are of a reasonable size. 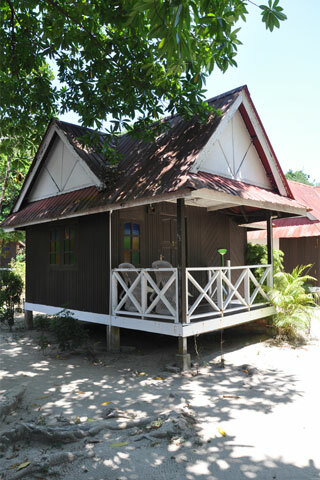 The bungalows at The Reef are better, but cost a little more and if you’re on a budget, Mama’s is a better bet. There’s a good sized restaurant on site -- service is glacial so bring a book, or complain online via their free WiFi ;-) They’d be well served to computerise their check-in process – a lot of paperwork must be done before a key is handed over. While Mama’s is our number one choice, this isn’t a bad backup.